Man, it's hard to get up for work in the morning. You know what a good soure of stress relief is? 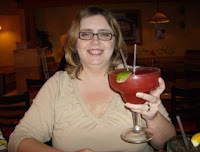 A Margarita as big as your head. And yes, I look like crap in this picture. Do I look bloated and tired? I AM BLOATED AND TIRED. Leave me alone. I can't believe you AGREED! I think that you look great!! I think that I may have a maragrita in your honor tomorrow night!! Oh honey, you look HAPPY. And totally cute. Let's make out. You look glamorous and fulfilled. Now gimme. Hey, look over there! It's a shiny thing! I'm bloated and tired too. Pass the margarita. Tired and bloated? Where? I dont see it.... hmmm the margarita sounds lovely though if you please! Love your blog. Will definitly be back! You and your blog look so great! There have been some changes around here in my absence. Congrats on the new job! And enjoy another margarita for me, will you?